Heading out at dawn or dusk puts you on the trail when most game is on the move - this is when light is at a premium and the stakes are high. ZEISS puts the odds in your favor with the Conquest 3.5-10x50 MC. 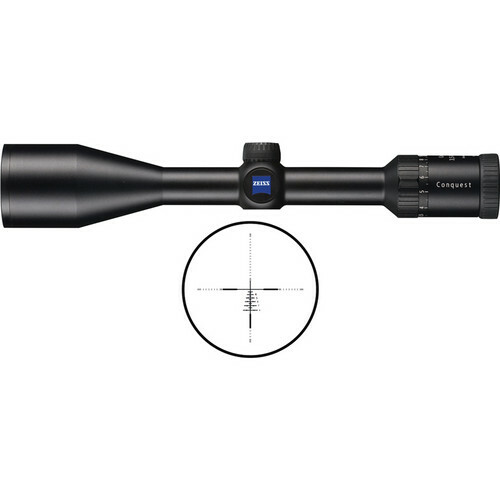 This fine sighting solution combines a favored and flexible 3.5-10x power range with stunning twilight performance from an outstanding 50 mm objective. ZEISS' Conquest scopes are configured with a 1.0" main-tube that's o-ring sealed and nitrogen filled to ensure all-weather performance. The optics are first rate, and every air-to-glass surface features ZEISS' MC multicoating for optimum light transmission, contrast, and resolution. 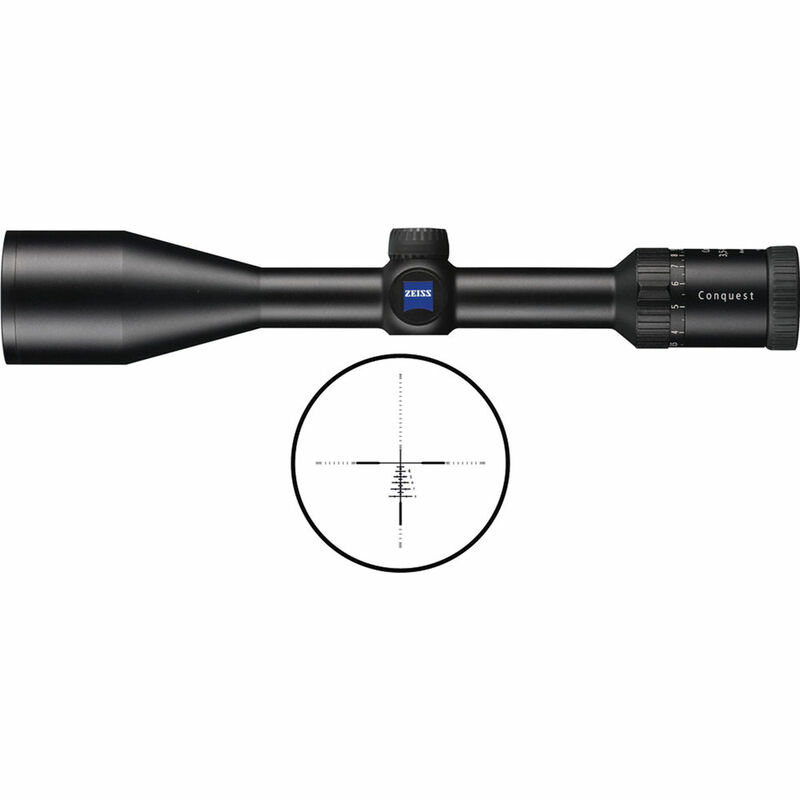 This particular Conquest scope features low profile hunting turrets that offer 1/4 MOA adjustments with a square adjustment range of 65.9 MOA. The Rapid-Z 800 reticle has been placed in the second (non-magnifying) focal plane, and the scope's exterior features a non-reflective matte black finish. The Rapid-Z 800 reticle: 3 floating posts at 6, 9 and 3 o'clock, with cross hairs. Graduated tick-marks and hash-marks across each post and stadia allow accurate hold-off and hold-over calculations. This Rapid-Z is calibrated for distances up to 800 yd. It is recommended for use with the following calibers; 300 Ultra Mag, .338 Ultra Mag, .30-378 Weatherby Mag, etc. Second focal plane positioning maintains the reticle's dimensions throughout the magnification range.